Our main research curiosity is driven by exploring climate forcing by variations of the Earth’s orbit on time scales from thousands to millions of years. Achievements include exploiting the fingerprint of this astronomical metronome, and to gain further insights into the (palaeo-)climate system, mainly by using material available through the Integrated Ocean Drilling Program (IODP). The main research interest is the Palaeoceanography of the Paleogene, using stable isotope measurements, and investigating the climate driven evolution of the worlds oceans. In detail, our aim is to advance the detailed calibration of the Geological Time Scale with astronomically driven climate cycles ("Milankovitch" cycles). The ultimate goal is a precise time scale for the entire Cenozoic. Building on this research, we also exploit the sediment record of past climate changes to refine astronomical models and extract physical parameters. 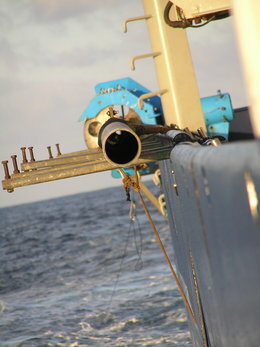 In addition to stable isotope measurements of oxygen and carbon, the data for this research are obtained by rapid and non-destructive sediment core measurements (MST, XRF) to generate high-resolution proxy records, mostly from cores obtained by the international ocean drilling (ODP, IODP). Current work centres on the recent IODP Pacific Equatorial Age Transect (PEAT). We welcome applications for research projects (e.g., Marie-Curie; Emmy Noether).